In this Sept. 30, 2018, rescuers assist 15-year old earthquake victim Nurul Istikharah from flood water in her damaged house following earthquakes and tsunami in Palu, Central Sulawesi, Indonesia. 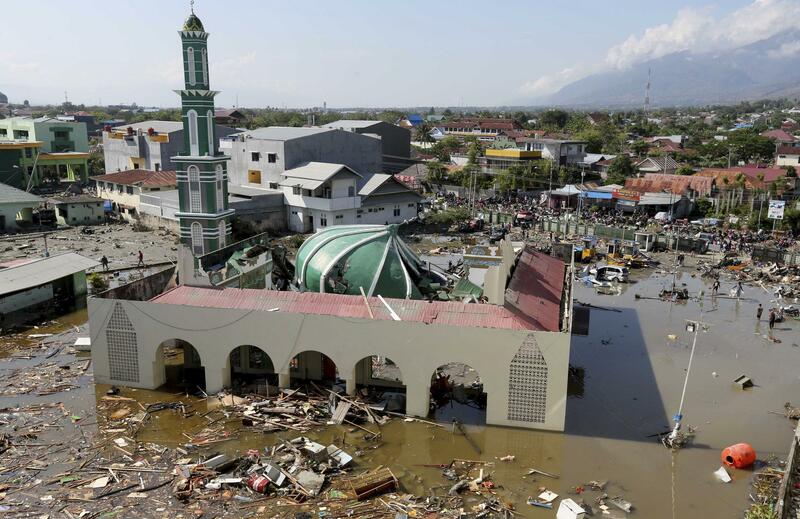 A damaged mosque in Palu. The U.N. Office for Disaster Risk Reduction says up to 1.6 million people could be affected by the earthquake. Residents walk past destroyed buildings in the Perumnas Balaroa village of Palu. The bodies of dozens of students were pulled from their landslide-swamped church nearby. 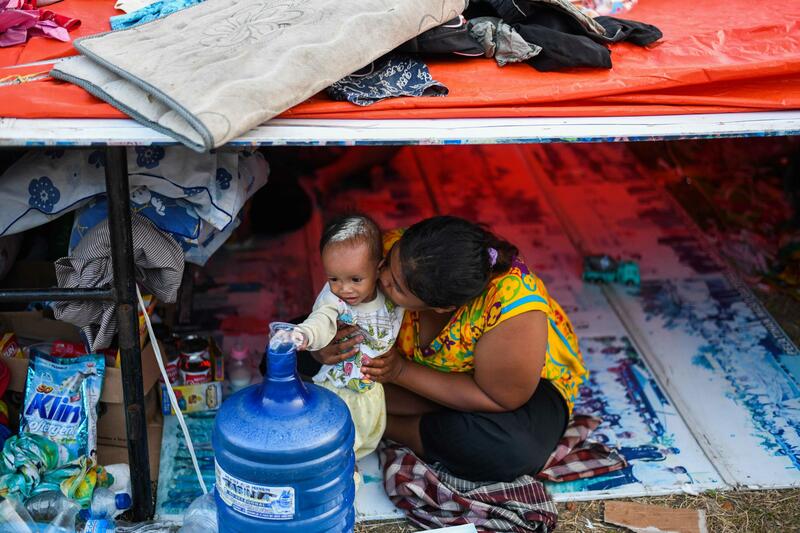 A mother and her child sit in a tent at a makeshift camp in Palu. The Indonesian government said Tuesday that the death toll from the devastating quake and tsunami on the island of Sulawesi had risen to over 1,200 people, up from the previous count of 844. Survivors set up a tent at a makeshift camp in Palu on Tuesday. 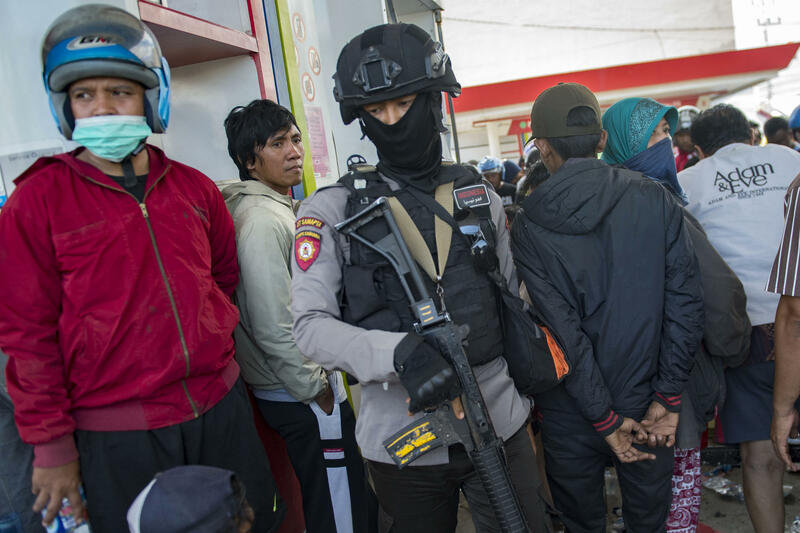 An armed policeman stands guard at a Palu gas station as people wait to obtain gasoline. Rescuers help 15-year-old earthquake victim Nurul Istikharah escape floodwater in her damaged house following earthquakes and a tsunami in Palu, central Sulawesi, Indonesia, on Sunday. This photo layout of satellite images provided by DigitalGlobe shows the Petobo neighborhood of Palu, Indonesia, on Aug. 17, prior to the earthquake, and on Oct. 1, devastated by the subsequent tusnami. 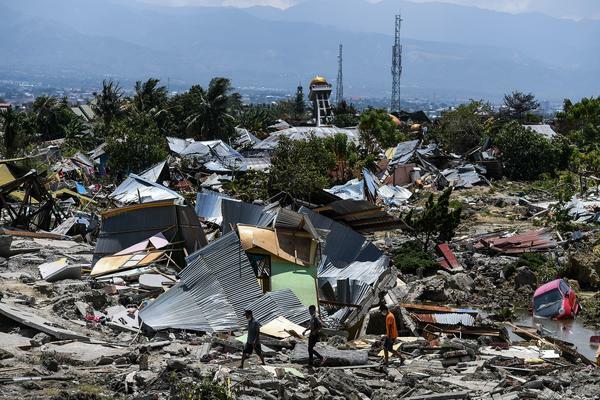 The 7.5 magnitude earthquake struck along the coastal district of Donggala on Friday, causing at least 1,400 deaths, injuring 2,500 others and displacing tens of thousands more. 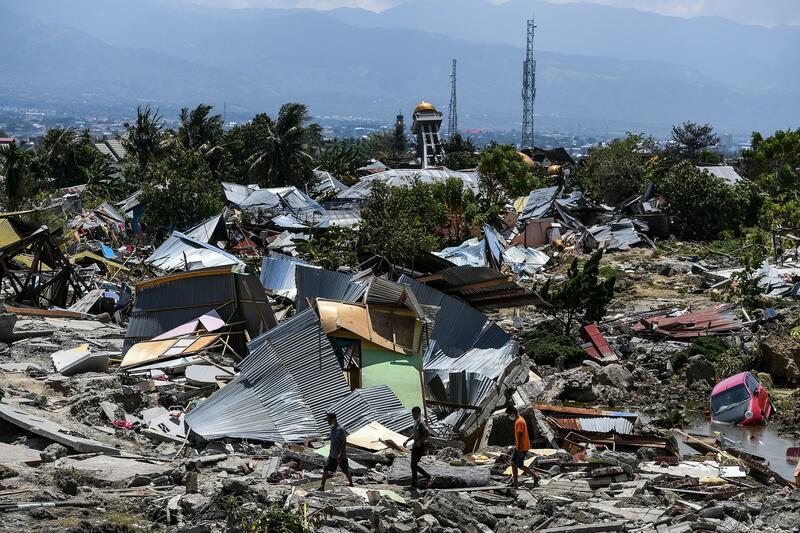 Most of the known dead are from the city of Palu, and many areas thought to be hard hit by the disaster have yet to be fully assessed for damage and deaths. The country has also suffered a series of aftershocks, according to the United States Geological Survey. Several jolts — some as strong as 6.0 magnitude — hit Sumba, an island hundreds of miles away from Sulawesi, on Monday. In addition to the earthquake and tsunami, a volcano on Sulawesi — Mount Soputan — erupted on Wednesday, spewing ash nearly 20,000 feet into the sky, according to The Associated Press. The AP reports that a government volcanologist believes the eruption and earthquake could be connected. Volcanic activity had been increasing since August and reportedly ramped up starting Monday. The vast Indonesian archipelago lies on the western portion of the "Ring of Fire" — a seismically unstable region, where both earthquakes and volcanos are common. The country's National Disaster Mitigation Agency, known as BNPB, is working to assist the displaced with shelter, hot meals and other aid. Relief coordination posts will be set up "soon" in the regencies of Palu, Donggala, Sigi and Parigi Mouton, according to the Jakarta Post. The agency has set aside the equivalent of $37.6 million in relief funds and declared a state of emergency through Oct. 11. 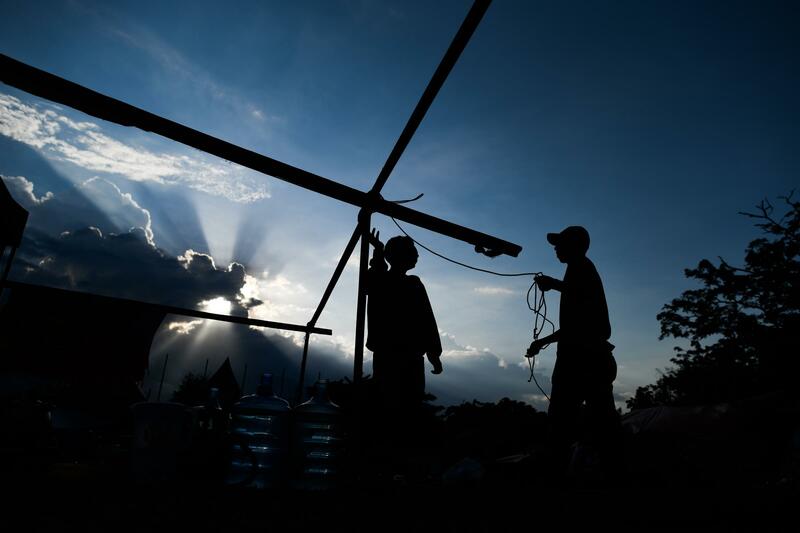 The country's central airport — where many have camped out — is unusable and aid must arrive to the hardest-hit areas by truck, slowing down efforts. Many gas stations in Palu have sustained heavy damage, and residents trying to leave the area are stuck waiting for gas. Some survivors outside Palu are intercepting aid trucks to plunder supplies and other essentials as aid begins to trickle in, according to the Jakarta Post. As NPR has reported, local and military officials arranged for a mass burial site for victims in Palu, overwhelmed by the sheer number of bodies. "Most of the deaths resulted from people being buried under rubble or being struck by the tsunami," reported the Jakarta Post. Others were buried when quake-loosened soils lost their cohesion — a phenomenon known as liquefaction. Hundreds of people remain buried in mud in the Palu neighborhood of Petobo, according to the Associated Press. Rescue teams are attempting to dig them out. Indonesian Vice President Jusuf Kalla told The South China Morning Post the final death toll may rise to the "thousands" once other regions outside Palu are assessed — such as Donggala, close to the quake's epicenter, which relief workers have been unable to reach. "We have heard nothing from Donggala and this is extremely worrying," said Jan Gelfand, head of the International Federation of Red Cross and Red Crescent Societies Country Cluster Support in a statement.